This comprehensive overview of biomedical applications of vibrational spectroscopy focuses on methodologies that are most relevant to biodiagnostics. After a few introductory chapters that summarize the current status of the field, the reference covers current spectroscopic applications; new spectroscopic directions; and study design and the analysis of vibrational spectral fingerprints from complex biological and clinical samples . 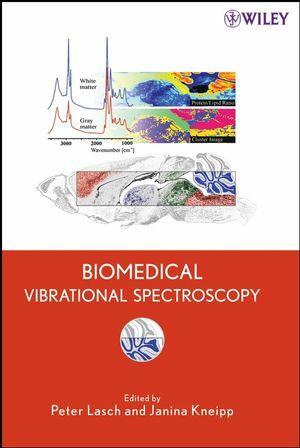 With chapters contributed by leading international experts, Biomedical Vibrational Spectroscopy is a core resource. PETER LASCH, PhD, is a Research Scientist with the Robert Koch Institute in Berlin, Germany, and a specialist in FTIR spectroscopy and its applications to the biomedical field. JANINA KNEIPP, PhD, is an Assistant Professor in the Chemistry Department of Humboldt University, Berlin. Drs. Lasch and Kneipp have authored and coauthored numerous peer-reviewed articles in the field of biomedical infrared and Raman spectroscopy. 1. Vibrational Spectroscopy in Microbiology and Medical Diagnostics (Dieter Naumann). 2. Biomedical Vibrational Spectroscopy - Technical Advances (H.M. Heise). 3. Biomedical Applications of Infrared Microspectroscopy and Imaging by Various Means (David L. Wetzel). 4. Infrared Spectroscopy of Biofluids in Clinical Chemistry and Medical Diagnostics (R.A. Shaw, S. Low Ying, A. Man, C. Riley, M. Vijarnsorn, K.-Z. Liu, and C. Mansfield). 5. Raman spectroscopy of biofluids (Daniel Rohleder, and Wolfgang Petrich). Melissa J. Romeo, Susie Boydston-White, Christian Matthäus, Milos Miljkovic, Benjamin Bird, Tatyana Chernenko and Max Diem). 7. Resonance Raman microspectroscopy and imaging of hemoproteins in single leukocytes (Henk-Jan van Manen, Cynthia Morin1, Dirk Roos, and Cees Otto). 8. Resonant Raman Scattering of Heme Molecules in Cells and in the Solid State (Bayden R. Wood and Don McNaughton). 9 Coherent Anti-Stokes Raman Scattering (CARS) microscopy (Ondrej Burkacky and Andreas Zumbusch). 10. Surface-Enhanced Raman Sensors for Metabolic Analytes (Olga Lyandres, Nilam C. Shah, Chanda R. Yonzon, Xiaoyu Zhang, Matthew R. Glucksberg, Joseph T. Walsh, Richard P. Van Duyne). 11. Surface-enhanced Raman scattering for investigations of eukaryotic cells (Janina Kneipp, Harald Kneipp, Margaret McLaughlin, Dennis Brown and Katrin Kneipp). 12. Combining Optical Coherence Tomography and Raman Spectroscopy for Investigating Dental and Other Mineralized Tissues (Lin-P’ing Choo-Smith, Alex C.-T. Ko, Mark Hewko, Dan P. Popescu, Jeri Friesen and Michael G. Sowa). 13. Chapter on AFMIR photothermal technique and its applications (Alexandre Dazzi). 14. From Study Design to Data Analysis (Wolfgang Petrich). 15. Interpreting several types of measurements in bioscience (Achim Kohler, Mohamed Hanafi, Dominique Bertrand, Astrid Oust Janbu, Trond Moretro, Kristine Naterstad, El Mostafa Qannari, Harald Martens). 16. Classification of spectral data in biomedical spectroscopy and imaging (J. Schmitt, T. Udelhoven).